Inspired by the recent fact-finding mission of veteran reporter Jim Acosta to the Texas-Mexico border we here at the Worldwide Headquarters of Manhattan Infidel™ also want to investigate walls to see if they work. Not wanting to step on Acosta’s toes and feeling that he has finally ended the debate about whether the border wall with Mexico is moral I instead headed to San Francisco to investigate the wall that surrounds the home of Speaker of the House Nancy Pelosi. 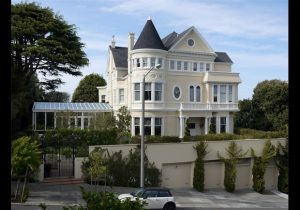 To wit: Has the wall around Speaker Pelosi’s home worked? Are we seeing a decrease of Mexicans seeking to leave her home to enter the rest of San Francisco? I arrived at her residence and at first found no signs of a visible crisis. I walked the perimeter of Pelosi’s mansion and everything seemed normal. But being the intrepid reporter that I am I decided to buy a ladder from a local hardware store so I could peak over the wall and get a first hand view of Pelosi country. I brought the ladder back to her home and went up to the top of the ladder and peered over the wall. What I saw shocked me. Below me ranged hundreds of Mexican nationals on her property. Some were washing clothes. Some were cooking. A few were digging holes in the property to steal underground copper wires. I was greeted with a round of boos and middle fingers. Obviously these simple Mexicans did not hear me correctly so I repeated myself. Finally one woman approached me. I asked her what she did and if any of her fellow Mexicans would like to come over to the other side of the wall. I asked her how Pelosi was mean to her. Shocked I asked the other Mexicans to come forward and asked them if they would like to escape to the other side of the wall. It is then that I knew there was a humanitarian crisis at the wall. I knew then that walls were immoral and only racist alt-right white nationalists like walls. I knew that the wall had to be torn down. I told these simple peasant folk that I would be their savior and that I would dedicate my life to seeing that they could enter freely to the other side of Pelosi’s wall. But then one of the simple, uneducated Mexicans threw a rock at me which hit me in the head. I fell off the ladder onto Pelosi’s property where I was promptly surrounded by Mexicans who beat me and took my wallet. You know what? Walls work. We need to build more walls. Brave of you to report on that, Infidel. I”m collecting Government Shutdown poetry, preferably haikus. Would you like to contribute?